The IONFlex from Shark is committed to cleaning different types of surfaces ranging from floors to carpets and ceilings without hassle. The self-standing cord-free unit will provide the users with extended cleaning time and spare them the risk of stumbling over cables or interrupt the cleaning to plug the vacuum in different power sockets. It is versatile and flexible enough to enable you to clean most surfaces in your home with ease. Weighing 8.7 pounds and measuring 13.4 x 10.4 x 45.9 inches, this model might prove to be a bit heavier for some people especially if it used for long cleaning sessions. The sweeper boasts multiple features that lead to a heavier build, though, and there are models that weigh even more and don’t come with the same characteristics. With this vacuum, you get a product that will enable you to clean various surfaces in just one session. It can be used for hard floors and even polish them. Moreover, the vacuum was designed to clean carpets and help you remove dirt and dust from hard-to-reach areas. The MultiFLEX technology will allow you to bend the wand and thus clean all the corners and spots in your house. Cleaning shelves, corners, and those difficult-to-reach areas under the furniture gets way easier with Shark IONFlex. Furthermore, you can easily convert it to a handheld vacuum to clean areas above the floor or even clean your car. 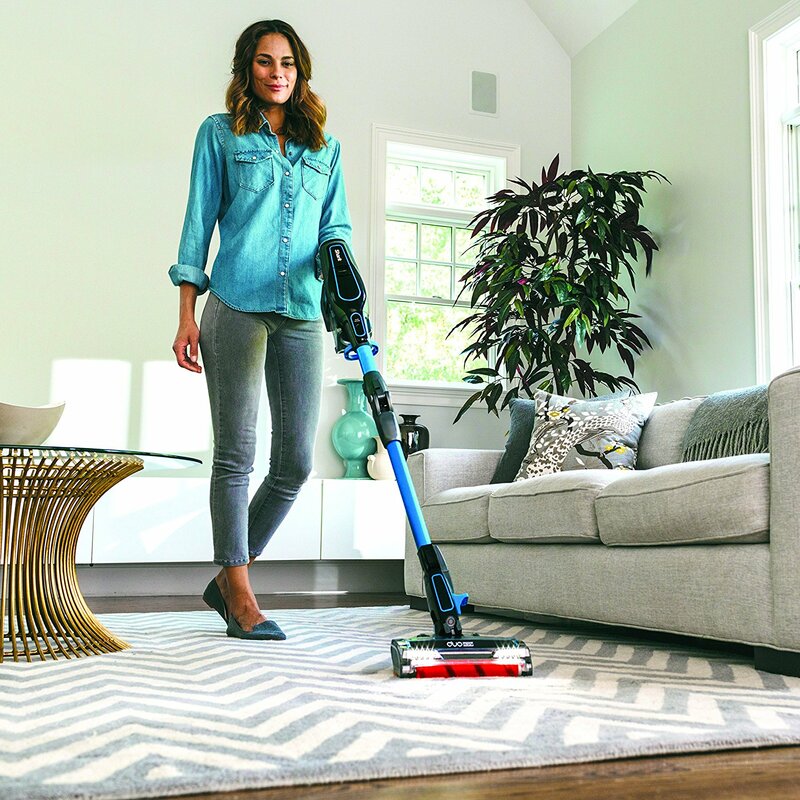 In case you’re interested in getting a new vacuum that will help you clean anything from floors to carpets and all those hard-to-reach areas such as shelves and corners, this model might be just what you need. 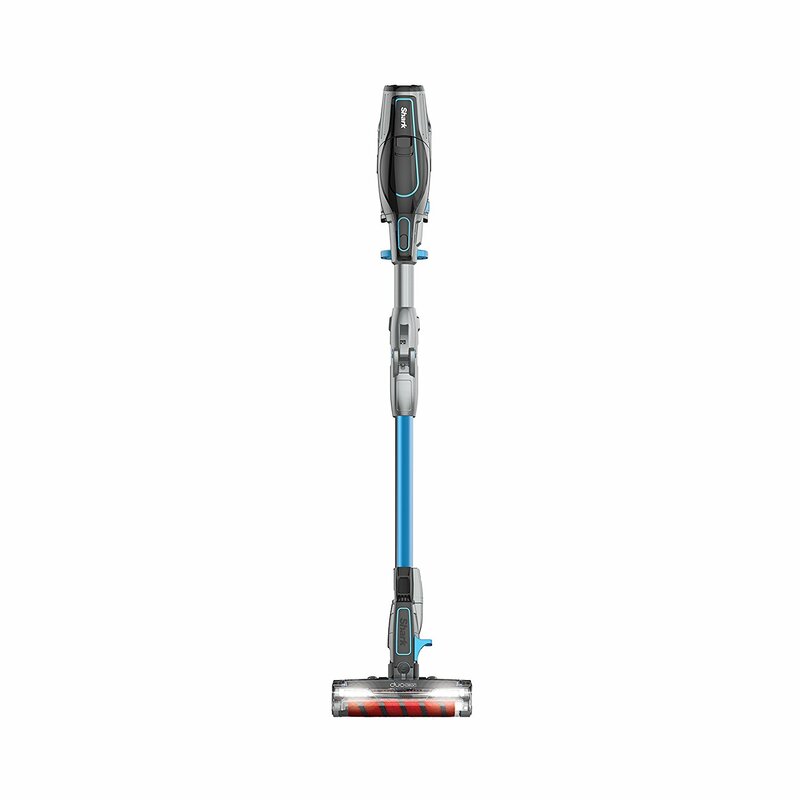 The freestanding cordless vacuum offers great flexibility when cleaning ensuring floor-to-ceiling versatility. It can be used to polish floors, deep clean carpets, and remove all the debris in between. Say yes to this sweeper and you say yet to hassle-free cleaning. The vacuum is powered by 2 removable, rechargeable lithium-ion batteries. No more cables spread over your room and no more risks of stumbling over and getting hurt. You won’t have to interrupt your cleaning to charge the battery as you can vacuum using one of them and charge the second one meantime. The pack also includes a charging dock. The versatility of this vacuum is ensured by the DuoClean Technology featured which allows the user to manage various types of surfaces. The bristle brush included will deep clean carpets whereas the soft brush roll will pull large particles and polish floors. This further means that you will be able to easily transition from floors to carpets. It takes just one push of a button to adapt the vacuum to power settings tailored for floors and carpets. The pack includes a crevice tool, a pet multi-tool, an anti-allergen dust brush, two batteries, a single battery charging dock, and a charger.